We can’t imagine our website without robots, so today we are going to speak about Centauro. 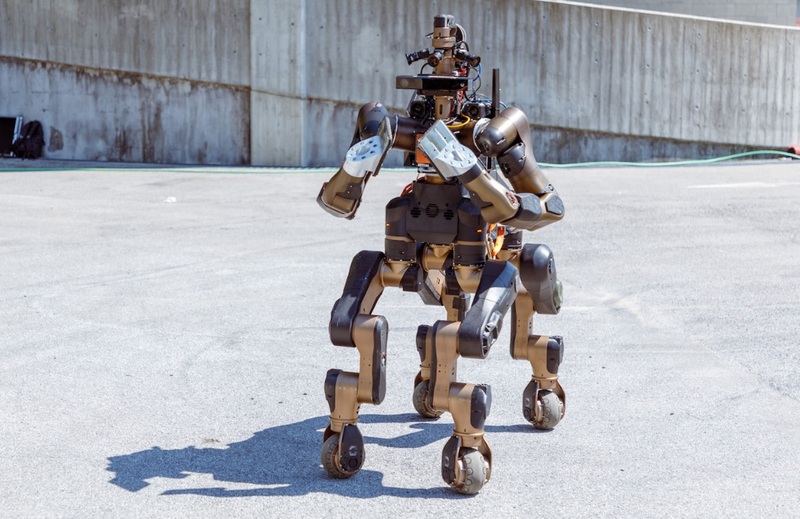 It is a new four-wheeled legs robot that was built at the Italian Institute of Technology (IIT) by a team led by Nikos Tsagarakis. Nikos Tsagarakis also heads IIT’s Humanoids and Human Centered Mechatronics Lab, in Genoa. Robot is made of lightweight metals, like aluminum, draped in a 3D-printed plastic skin. It is wholly a human-controlled machine that has a battery life of up to 2.5 hours. Its flexible design helps robot take different postures with its rotatable hip, knee, ankle, and six limbs with six degrees of freedom. According to spectrum.ieee.org “the goal of CENTAURO is building a “human-robot symbiotic system where a human operator is telepresent with its whole body in a Centaur-like robot, which is capable of robust locomotion and dexterous manipulation in the rough terrain and austere conditions characteristic of disasters.” From the look of things, Centauro shares the same kind of rugged capability we’ve seen in other IIT robots, like WALK-MAN, meaning that this could be a robot that manages to be both a research tool and real-world useful”. The appearance of the robot; it is a 1.5-meter-tall, and the weight is 93 kilograms. It is made of lightweight metals like aluminum, magnesium, and titanium, with skins of 3D printed plastic. According to Nikos Tsagarakis: “The visual perception system of Centauro follows closely the principles and sensor arrangement that was developed in Momaro. And Centauro’s locomotion has been inspired by Momaro as well. But compared to Momaro, Centauro’s leg kinematics is different, providing more flexibility in adjusting the orientation of the leg end-effector (wheel) with respect to terrain. … Furthermore, the manipulation capabilities and kinematics of the Centauro arms are very different, with improved manipulability and strength. Centauro also has torso mobility that is missing from Momaro”. “One goal is to validate the robot’s performance in increasingly more complex locomotion-manipulation tasks that will involve high payloads and harsh physical interactions”, added Nikos Tsagarakis.